Central Idea: Christ’s redemption is for all. Doctrine: Christ has come to save every person who wants to be saved. Practical Application: Personal apostolate is our participation in the saving mission of the Church. Click here to view the readings for Lectionary 20. For the Jews, Jerusalem stands for their own redemption. God’s salvation for the Jews is portrayed in terms of light. The various peoples of the world—the Gentiles—will respond by thronging to Jerusalem with tribute, including gold and frankincense. The Jews scattered in the diaspora will return. We Christians read this as a prophecy of the Nativity of Christ. Jerusalem stands for the Church triumphant, for the Kingdom of God fulfilled, for heaven. 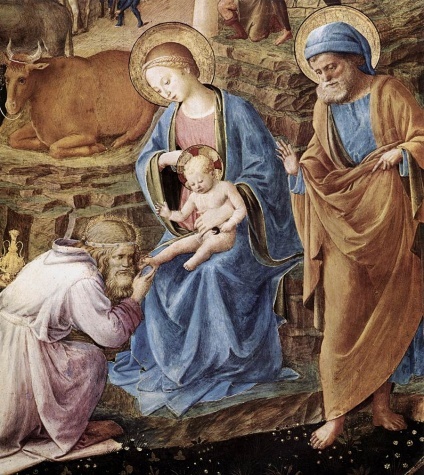 Gentiles—the Magi—bring the Christ Child gifts of gold, frankincense, and myrrh. We Gentiles do bring our tribute, our wealth, before Christ: Our intellects, our wills, our love, our family life and friendships, our work, everything. When we are not sleepwalking through life and realize what is really going on, we too are radiant at what we see, and our hearts throb and overflow. Joy ought to accompany us at all times, even during hardships. Christ fulfills the promises of the Jewish prophets because his salvation is for the whole world. Many of the “mighty” have given Christ their homage, beginning with the Magi. The primary “justice” Christ the King brings to the earth is the restoration of original holiness and justice, which Adam and Eve lost for the human race. Restoration of original holiness means we can be in a right relationship again with God: We can be friends of God and his adopted children. Restoration of original justice means we can begin even now to be in a right relationship with ourselves, with others, and with the created world. In other words, the transformation will begin in which we do not experience constant inner conflict, are not always suspicious of others, and are not always afraid of suffering and death. Thank God that we are all “lowly” and “poor.” We are the ones Christ came to redeem. “The Gentiles are coheirs, members of the same body, and copartners in the promise in Christ Jesus through the gospel.” In other words, Christ didn’t just come to save his own people, the Jews, but all human beings. This is the reason why God inspired the pagan Magi to bring their gifts to the Christ Child. Herod is the anti-king, the stark opposite of what God promised in Isaiah and of the kind of king Christ presented himself as. The gospel is for the Gentiles, too; that is, the non-Jews, all of us. Jesus has identified himself in some way with every person (GS 22 § 5; cf. § 2; CCC 618). He identified himself with every unborn child and every baby who would die of natural causes or by murder. Herod’s slaughter of the innocents, and infanticide, abortion, and infant sacrifice—all these existed in the ancient world and have continued ever since due to sin. The truth that Christ is the savior of the world is clearly present in today’s readings. The Magi were Gentiles who were “ignorant of the Gospel of Christ and of his Church” but they sought “the truth” and did “the will of God in accordance with [their] understanding of it.” They even obeyed the prompting of the Holy Spirit, without knowing who the Holy Spirit is, by heeding the dream’s warning and not going back to Herod. Today, this call applies first to the pope and the bishops united to him and then to Catholic priests. However, it applies to each one of us, too, to all laypersons. Apostolate is our participation in bringing the Gospel to others. For many of us, apostolate means to reintroduce the Faith in cultures in which it previously existed–in other words, in our own. Before a Catholic can share the Faith, he or she must know it and live it. In fact, unless one knows and lives the Faith, why would one even want to share it? Do we know how good Christ is and how desirable it is to be united to him? To want to share the Faith and to be able to share it requires an interior life. This means having a life of prayer. A life of prayer is a regular encounter between you and God. Prayer means talking to God. Prayer means listening to what God has to say to you. God speaks through his Sacred Scriptures, the doctrines of the Faith, the moral law, the inspirations he sends you in prayer, and the circumstances of your life. For example, if you just had a baby, isn’t God telling you all kinds of things by that very fact? Apostolate is primarily done by example. As St. Francis is reputed to have said, “Preach the gospel at all times; if necessary, use words.” He meant that the witness of living the Faith comes first. One should also be prepared to explain or defend the Faith with words. This requires knowing the faith and knowing the faith requires serious study. Apostolate also takes initiative. Christ did not instruct his Apostles to wait for people to come to Jerusalem to lay their treasures at the Apostles’ feet. Instead, the Apostles were to go out into the world and lay their treasure of the Faith at the feet of those without faith. We can go looking for today’s Magi who have not yet left on their journeys. There are many people around us who we might justly recognize as better than us, but who don’t yet know, or who have forgotten, or who have even rejected the Faith. This is our field of apostolate. And the person might be one’s spouse, child, parent or sibling, friend, or co-worker.